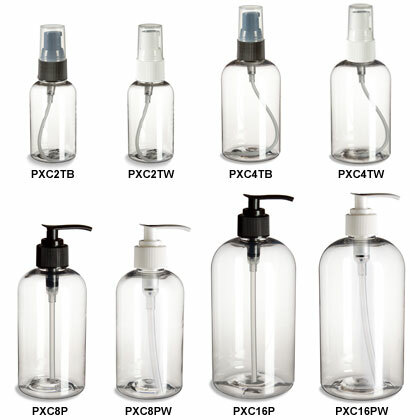 Big on style at a low price, these attractive Boston round clear plastic pump bottles are a great way to show off your beauty, bath, or hair care product. Durable, scratch-resistant and food-safe are just some of the attributes that make PET plastic an increasingly popular choice for a wide range of products and industries. Our 2-ounce and 4-ounce bottles come with treatment pumps in your choice of black or white. Treatment pumps easily and precisely dispense creams, serums and cosmetics and come with a clear plastic hood. Our 8-ounce and 16-ounce bottles come with lotion pumps in either black or white.